Here’s something that might look a bit strange or even silly to someone who doesn’t live in the American midwest. What you’re looking at is a tornado siren, and it’s not an uncommon sight around Oklahoma and many other parts of Tornado Alley though the exact shape and appearance of the sirens varies greatly depending on where you are: back home in Nebraska these sirens looked more like outsized bullhorns, but in Oklahoma they often resemble forty-foot-tall honey dippers. Most of the year these sirens stand watch, sentinels of the prairie ready to let loose a piercing wail if a twister threatens to close in on the community. This particular siren is a few blocks from my house and my wife and pass by it several times each week when we go out walking or biking with our kids, and I thought it would make for an interesting photographic exercise: how to capture the slightly surreal nature of this object with a 50mm lens? When we went out on a recent walk I had no particular intention of taking a picture of this thing, but since I had my camera with me (as I usually do when we go on walks, thanks to my recently-acquired Black Rapid Curve) I decided to go for it. The problem, as often happens with a 50mm lens on a crop sensor camera, is that it’s hard to fit much in the frame without standing way, way far back from your subject. In this case I could have taken a picture of the whole siren pole by standing halfway down the block, but that would have reduced the giant obelisk to just another feature on the horizon since many other trees and houses would be in the shot as well. I also tried shooting up close, but it made for a very confusing image to just see the siren and nothing else. Thus my dilemma, and one I keep coming back to on this blog: how to imbue a photographic subject with a sense of context. In this case I wanted to demonstrate the sheer size of the siren, so I deliberately framed the object next to a tree. 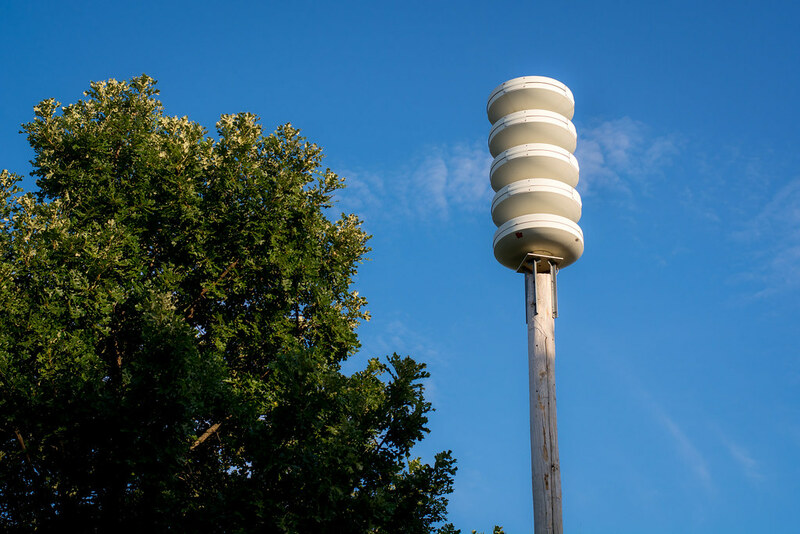 Even if you have never seen a siren like this, seeing it next to a tree should give you a clue as to its height as well as its overall diameter. I also wanted to make room for the sky in this picture because it conveys (I hope) the man-vs-nature dynamic at work here: when storms rage and tornadoes threaten, this siren will warn the neighborhood and give us time to take shelter lest we all get swept away. As for camera settings, I kept it simple: F/4, ISO 100, and 1/750 second shutter. No shallow depth of field or other photographic tricks were required, and in a way I kind of like that. Sometimes simple is better, and after I shot this I put away my camera, ran to catch up to my wife and kids, and just enjoyed our walk. Like the way you captured the wispy cloud just behind the alarm. At first glance, I thought the alarms were emitting steam. By chance or design, an interesting way to add drama. You know, I didn’t even consider that until I read your comment but I like how you just introduced me to a new perspective on my own picture :) Thanks Chris! Boring…Boring…Boring. Wait– could there be something in this picture that we rank amateurs can use? Well, Rule of Thirds was followed and yielded good results. Also, the way there is both sun and shadow on the siren is thoughtful. Lets me know that the sun was bleeding in from the right — through a tree? Finally, the sky was really blue. ND filter or enhanced by Lightroom/Photo Shop? Indeed, I found this week’s picture to have quite a lot for us to digest. I thank you again for reminding me that there is a nearly infinite menu of items we can photograph. Praise our Lord! Thanks David! I must admit this isn’t the most interesting picture, but I like that you enjoyed it and found a few takeaways anyway :) I don’t remember offhand but I don’t think I did much to the blue sky in Lightroom–what you’re seeing here is pretty much straight out of the camera with no ND filters or anything else either.